The toteboard lights up after longshot Volponi wins the Classic. This was the second highest payoff in the history of the Classic. Preliminary totals from all sources on the 11 race card of the Breeders' Cup World Thoroughbred Championships held Saturday at Arlington Park established a new event record of $115,523,156. The new record breaks the old mark of $108,603,040 set at the 2000 Breeders' Cup at Churchill Downs. It was also more than last year's total of $104,145,923 wagered at Belmont Park. 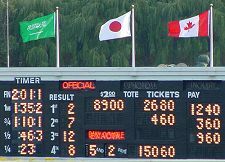 A total of $13,568,233 was wagered by the crowd of 46,118 at Arlington Park while a total of $101,954,923 was wagered at off-track facilities in North America and overseas. These figures do not include a limited number of international wagering outlets which will be reported later. Total handle for the new Head to Head wager was $768,894 over seven races. There was no Head to Head wager on the Bessemer Trust Breeders' Cup Juvenile due to the scratch of Sky Mesa. A total of $4,646,289 was wagred on the Breeders' Cup Ultra Pick 6. There were six winning tickets, all purchased at Catskill OTB in upstate New York, with a payout of $428,392 each plus a consolation of $4,606.20 for 5 correct out of 6. The NTRA and Breeders' Cup Ltd. formally requested the New York State Racing and Wagering Board to investigate unusual circumstances relating to the winning Pick Six wagers made Saturday at the Catskill Region OTB. The request was made Monday morning by letter from NTRA Commissioner Tim Smith and Breeders' Cup President D.G. Van Clief to New York State Racing and Wagering Board Chairman Michael Hoblock. According to information provided the NTRA, each of the winning tickets involved single picks for the first four Pick Six races followed by "all" selections for the final two races. The unusual nature of the winning wagers prompted the Breeders' Cup's request for a thorough review. "Our obligation in this case clearly is to protect the customer and the integrity of the process," said Breeders' Cup President D.G. Van Clief. "We are simply asking for a complete and rapid investigation by the proper authorities to determine the facts and to maintain confidence in all aspects of our competition." Breeders' Cup Video Preview - online video of all the prep races leading up to the Breeders' Cup. Requires you sign up for a free userid and password to access this.